With Terry Moore off of Runaways, a new creative team has come together for a single issue to tell a couple of stories, one significantly longer than the other. When I saw the solicitation for this issue, I was excited. Christopher Yost is one of my favourite writers at Marvel Comics, and having him bring his abilities with books starring teenage characters to a title like Runaways seems to be an inevitability. After reading this issue, I hope Yost returns to this title sometime in the near future, having written an amazing one-off story. The second story, written by James Asmus with art by Emma Rios, is only about half the length of the first, but packs in quite a lot of fun for being a such a short story. 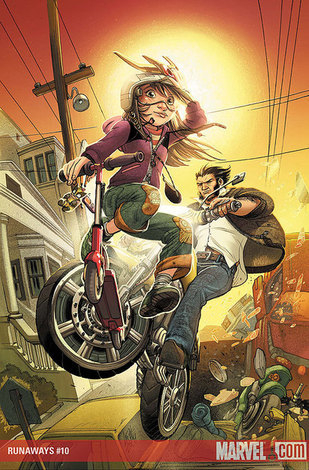 The first story, written by Christopher Yost and art by Sara Pichelli, follows the most junior member of the Runaways on a trip to check out the new headquarters of the X-Men in San Francisco. This brings a wonderful reunion of Molly with Wolverine, two characters who play very well off of each other as Wolverine is clearly not designed to deal with eight-year olds with super-strength. A lot of the humour of this issue draws from the juxtaposition of these two characters, some of the more memorable being Molly using the danger room to create unicorns and butterflies and the subsequent punching him through a wall, only for Cyclops and Emma Frost to get a full assault of profanity from Wolverine. While they are at each others throats, the story does finish off with a more tender moment between the two of them. Some of the better moments involving Molly throughout this series is the recognition of how young she really is and how the knowledge of how evil her parents were affects such a young character. Yost creates a moment of this as she is faced with an old adversary of her parents, and from this Molly shines again. Often used as a source of comedy (and rightfully so), seeing a deeper layer of Molly is nice as well. Sara Pichelli’s art complements the story very well. Emotionally expressive with some exaggeration for dramatic and comedic effect works well with the story Yost has written. The characters are a little melodramatic to reflect their over-the-top attitudes and actions. Christina Strain’s bright colouring adds to the the whole effect, lighting up the world Molly is inhabiting. The bonus story in the back, written by James Amus with art by Emma Rios, moves at a much quicker pace. The story is only eleven pages and as such, much is left for the reader to fill in, like why the monster they are fighting is actually even there. But the final joke of the entire story more than makes up for these forgivable constraints. I have a feeling the joke was thought of first and the rest of the story after, but you will have to read it to get what I am talking about. 8.5/10 Delivers in every way a Runaways issue has become to be expected. Almost everything at the top of its game.